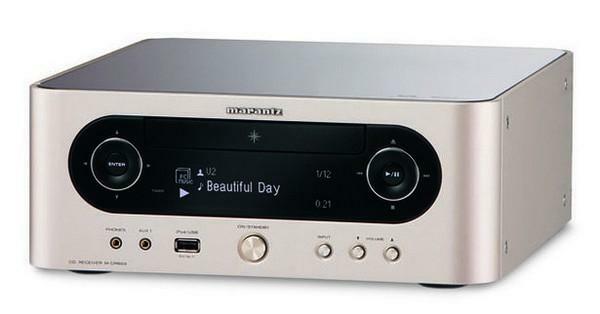 The gloriously-named Marantz Melody Media M-CR603 not only delivers great sound quality, pumped out at 50W per channel, it’s also one of the most flexible one-box CD receivers on the market. Not only does it come with the usual equipment you’d expect of a Marantz receiver – CD, radio and amp – it’s also got dozens of features you’d never expect from a Marantz system just a few short years ago. For example, it has an Ethernet socket and WiFi, both of which can be used to stream your tunes from your PC. It has DAB+/DAB/FM and AM radio tuners, and will let you control an iPod via its front-panel USB socket. If you want even more musical control, for £40 you can buy an add-on that will turn the Melody Media into an Apple AirPlay client, which will then stream your iTunes music whether it’s on your iPod, iPad, iPhone or even your PC. If Apple’s not your bag, plug the Bluetooth adaptor in the back, and stream music from any Bluetooth-equipped device, such as your mobile phone. The Marantz Melody Media really is a sign of the hi-fi companies at last adapting to the changes being made to the music scene via digital media and the Internet. Along with the equally-strong Denon Ceol, the Melody Media is one of the best Network Music Systems on the market now, featuring the perfect combination of sound quality, connectivity and price. Networked audiophiles will love it!